Laurens Vanthoor and Belgian Audi Club Team WRT took the Blancpain Endurance PRO drivers and Teams championships respectively following a comfortable victory for the #1 car at the very wet Nürburgring finale. With a six hour race in prospect and so many teams and drivers still in contention for all of the Blancpain Endurance championship accolades it was with great anticipation that we made the long drive to the Eifel region of Germany. Staying at the Hotel Zur Burg in ‘motorsport mad’ Nürburg itself allowed a short walk to the GP Circuit to catch the friday ‘bronze driver test’ shortly after arrival. You always remember the first sight of a new track and the heavy braking zone into turn 1 was as good as any; offering great viewing of the first 4 corners of the circuit. After a couple of Bitburgers, an awesome Argentinian steak at the Pistenklause restaurant and a brief watch of the German translation of Indiana Jones we were primed and ready for 2 full days of action at the track. Weather wise, Saturday morning was a stunner, with the 90 minute free practice session starting in near perfect conditions. Soon however, in true Nürburgring style, the fog would come in, followed by a heavy downpour later in the day. With a 90 minute Pre Qualifying session as well as a 1 hour session to set the grid, the drivers managed to witness nearly all possible weather conditions in one day. The 240 minutes of track time to go with the 6 hour race and good quality support events also making the €30 weekend admission fee very good value for money. While the #7 Bentley in the hands of Steven Kane went quickest in the first session, Andy Meyrick was not able to better this before the rain came down in the second. The two PRO WRT Audi’s on the other hand managed to put in great times early on, with Christopher Mies in the #1 R8 setting a 1:55.708 to take provisional pole. And although the cars still came out for the very wet third session there was no chance of improvements being made leaving the #52 Ferrari of Marco Seefried, Francesco Castellachi and Johnny Laursen to take the PRO-AM pole with third on the grid and Kane’s session 1 time in the M-Sport Bentley being quick enough to complete the second row. 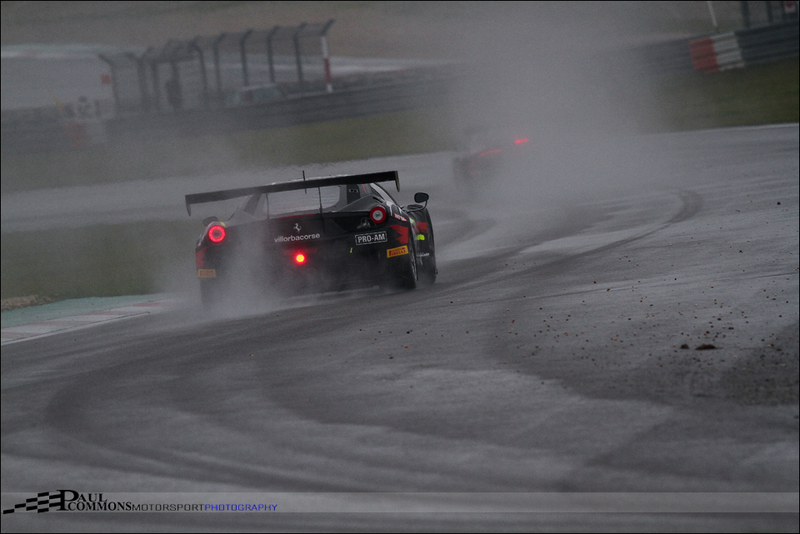 Alexander Mattschull meanwhile was the quickest gentleman trophy runner in the #458 Ferrari with a 1:58.994. “Kein gutes wetter” was how we were greeted at breakfast. The thick fog, which would cause the cancellation of the Formula Renault race, easing after the emergence of heavy rain; heavy enough to question whether the race may be delayed as a result. Treacherous conditions are common place in this part of the world however and pleasingly, although behind the safety car, the race got under-way at the scheduled 11.45am start time. And even more pleasingly the safety car was in the pit lane 20 minutes later. The field managed to tip-toe around turn one, but by the time the cars reached the exit of the Mercedes Arena, the championship contending #98 ART Mclaren and #26 Santeloc Audi had already clashed, with each losing several laps in the pits and effectively ending their title hopes. This left just the #7 Bentley, #1 WRT Audi and #84 HTP Mercedes to battle it out for the PRO cup honours. Up front, the lead WRT Audi of pole sitter Christopher Mies had a real battle on his hands in trying to keep the #99 ART Mclaren of Kevin Estre behind. After several laps of trying the Frenchman finally getting passed with a brilliantly brave move down the inside of turn 1. Estre was not able to pull away though with the gap remaining at roughly 1 second throughout the entirety of the first stint. The big Bentley on the other hand was struggling in the conditions, falling back and losing touch with the lead pair. Conversely Alex Buncombe in the PRO-AM RJN Nissan was flying, passing several cars including the #52 Ferrari of Seefried to take the class lead. And after the first round of pit stops, an inspired decision to leave take fuel only meant the red and white machine would emerge from pit lane in the lead of the race with the 2 HTP Mercedes also managing to make up ground. Cesar Ramos now in the #1 Audi meanwhile was unable to match the pace of Mies and was falling back along with the #99 Mclaren of Kevin Korjus. The only other safety car period, roughly half way through the race proved to be controversial to say the least, somehow picking up the second place car in error, allowing the #19 Black Falcon Mercedes (leading as a result of a late pit stop) to blast around to the pits and still emerge in the lead. This break in proceedings also brought the #1 Audi back into contention with Mies reinstated at the wheel. Others were not so lucky. Alex Buncombe’s hard work in building a healthy race lead came to nothing as his PlayStation academy team mates were unable to keep pace, quickly falling foul of the very rapid Nick Catsburg in the #12 TDS BMW who was now leading PRO-AM. Meanwhile the championship contending Bentley was not only struggling in the wet, but also suffering drive through penalties as a result of pit lane speeding and pit-stop infringements meaning their only hope lay with a WRT retirement. As the race settled back down it wasn’t long before Mies was on the tail of Hubert Haupt’s Black Falcon Mercedes and taking the lead of the race. And by the time Laurens Vanthoor took over the car, the PRO Cup title was firmly in his grasp as the #84 HTP Mercedes, piloted by Harold Primat, lost several minutes in the gravel at the final corner. While the Belgian was able to cruise to victory, a drying track presented the opportunity for the slick shod #85 Mercedes, with Step Dussledorp at the wheel, to rapidly close on Abdul Al Faisal (now in #19), taking second place from the similar machine with just half an hour left on the clock. Further back, Alexander Sims in the Triple 888 Racing BMW and Steven Kane in the #7 Bentley were setting the track alight. And for once the works BMW pilot was ‘out foxed’ by Kane heading into turn 1 as they both came through the field, with Kane eventually finishing 8th, and Sims just one place further back. In PRO-AM no one was able to get near Catsburg’s BMW as he and Henry Hassid finished a very credible 4th overall to take the class victory. While Castellachi’s championship hopes were ended with a trip to the gravel, second in PRO-AM went to the Black Falcon Mercedes of Devon Modell, Anders Fjordbach and Vladimir Lunkin, with championship victors Thomas Kemenater, Stefano Gai and Andrea Rizzoli taking third in the Scuderia Villorba Corse Ferrari. Ian Loggie and Julian Westwood put in a solid performance to take the Gentleman Trophy honours with 17th overall in their Audi R8 while 7th in class was enough for Peter Mann, Filipe Barreiros and Francisco Guedes to take the crown in their Ferrari 458. In many respects I am glad that we saw the Nürburgring in typical wet conditions as anything else just would not have seemed right. It is amazing how well the circuit coped with such a continual downpour and proved that in a health and safety mad world very wet races can still take place on well drained tracks. The viewing at this famous German track was second to none with half the circuit visible from the BMW and Mercedes grandstands and whilst I wasn’t able to understand much of the circuit commentary, replacing the battery in my Iphone before travelling had enabled the excellent Blancpain timing app to keep me updated throughout the race. My only real gripe being that half of the circuit was not open to the public meaning the usual anti-clockwise loop to take in an endurance event was not possible.